History: Several years ago a company called Genomex carried out a series of illegal and immoral experiments on human subjects, forever altering the DNA of any children they might have, to make them mutations from the norm. Now many of those children have grown up, and it has become increasingly difficult for the rest of the world to ignore the mutants in their midst. Genomex, under the direction of Mason Eckhart, on of the original scientists, seeks to exploit it's creations; others seek to protect them. 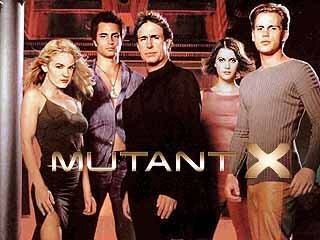 A mutant Underground has sprung up, and one of the most prominent cells in that organisation is Mutant X, a team of powerful mutants led by Adam, formerly another one of the Genomex scientists who participated in the experiments which has altered our world forever. The show was created by Avi Arad (who is also one of the executive producers), most commonly associated with Marvel Comics film projects, so it's hardly surprising there is more than a passing similarity in the premise to the similarly titled X-Men. Adding to the shows comic book credentials was Howard Chaykin, creator of American Flagg (among many others), who was the shows head writer for the first season. According to the show, there are four types of mutants - Elementals (those who control and manipulate forms of energy, such as electricity or heat); Ferals (those with animalistic traits - we've seen feline, canine, snake, frog and fish-like mutants); Psions (those with mental powers such as telepathy , precognition or telekinesis); and Moleculars (those who can manipulate matter and break the apparent laws of physics, often their own, granting intangibility, invisibility, and even temporal manipulation). While Genomex' experiments have created a boom in the mutant population, later episodes make it clear that there have been a small number of mutants hidden amongst normal humans for millennia, with at least one such example dating back to ancient Egypt. Thanks to John Schultz for providing some additional information on the characters. 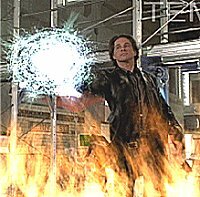 There is a Mutant X fansite with links to many others here. Powers/Abilities: Superb strategist and tactician. Skilled martial artist. One of the smartest men alive, with an unrivalled knowledge of genetic sciences. History: Adam was once a Genomex scientist, until he grew disquieted with their questionable ethics, after his genetic research inadvertently helped create the new wave of mutant humans. He left Genomex and dropped out of sight. He helped to form the mutant Underground, and set up Mutant X, a team of powerful mutants who could fight, if necessary, to maintain mutant freedoms. While he lacks powers of his own, he more than makes up for this with his tactical skills and genetic knowledge, which has served to find cures for team members when they have been poisoned or infected by genetically altered diseases. The team recently found out that Adam has been working for a shadowy group known as the Dominion since before he founded their group. Though he appeared to have died in the same explosion that killed Emma, Adam recently revealed himself to be alive and anonymously aided Shalimar on missions for the team. Adam also created at least one other Mutant X team before the current one. Though Lexa was a member of this team, the fate of it's other members is uncertain. 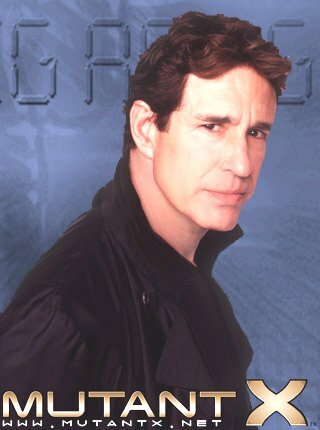 Comments: Adam is played by John Shea. 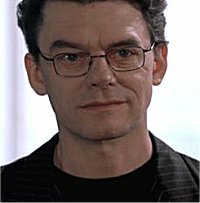 When a young version of him was seen in the time travel episode Time Squared, the part was played by Christopher Jacot. Thanks to John Schultz for additional information about Adam. History: Shalimar is the daughter of a rich industrialist, Nicholas Fox. 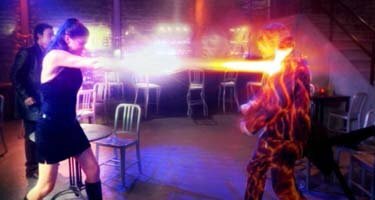 When her powers first manifested, he had her locked away, but she escaped, and eventually was recruited by Adam into Mutant X. Since then she has been reunited with her father, only to discover he has gone in with Genomex in return for them promising to "cure" her. She is also slowly developing a relationship with team-mate Brennan Mulwray. Comments: Played by Victoria Pratt. Powers/Abilities: Brennan can generate and control electricity, able to throw lightning bolts at will. In fact, it may be he can transform into living, sentient electricity, as on one occasion a mutant who could absorb energy actually merged with him. Exposure to water can short him out if he is using his powers at the time. He is also a skilled martial artist. Brennan briefly gained the ability to fly, but seems to have lost that ability again. History: Brennan Mulwray was a thief and a good one, until Genomex caught up with him. 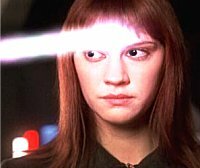 They were actually pursuing Emma deLauro at the time, as was Mutant X. He declined the latter's invitation to join only to be captured by the former. Upon regaining his freedom, he decided that perhaps the cause of fellow mutants was his concern and joined the fight against those who would exploit them. As time has passed, he and team-mate Shalimar have slowly begun to explore their mutual attraction. He loves being a mutant, but is also secretly afraid of his own powers, afraid he might lose control. Powers/Abilities: Jesse is able to alter his body's density, becoming immaterial or super-dense at will. In the former state he can walk through walls; in the latter, bullets bounce of him and he is superhumanly strong. He can only remain phased for around thirty seconds at a time without risking becoming permanently stuck, and he has to return to normal to breathe anyway. He has gradually built up his power until he can selectively alter only part of his body at a time, and so that he can also affect things he is touching - the largest object he has phased was a plane. He is also a skilled martial artist. 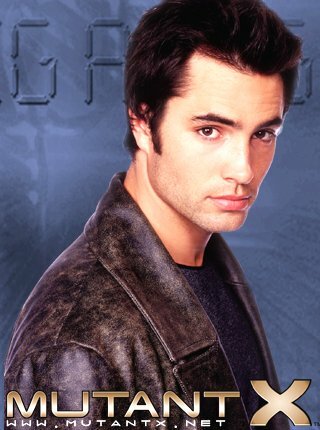 History: Jesse comes from a sheltered background prior to being recruited into Mutant X. Since joining the team he has undergone an abrupt and often painful initiation into what the wider world can be like. He is secretly afraid of being imprisoned, possibly because his power to turn immaterial means nothing could normally restrain him. Powers/Abilities: Emma is a telempath, able to communicate her feelings to those around, and to read those of others. She is not telepathic, and cannot read minds, but can get learn a lot about a person's state of mind from their emotions. Her powers have grown during her time in the team, and she has learned to stimulate hidden memories, or transfer images from someone's mind into a computer. She once absorbed a piece of a dying man's psyche, effectively becoming possessed by his ghost for a little while. She also seems to have far greater powers than she has admitted to the group - when she stretches her abilities further than normal her pupils fully dilate until her eyes seem totally black. She is also a skilled martial artist. History: Emma was on the run from Genomex when she first encountered Mutant X. While reluctant to join them at first, she soon saw the need to do so. Since then she has been a loyal member of the team, and undergone some bizarre experiences, such as being possessed by someone's ghost, travelling back in time, and even being split into two separate entities (Kill us both, Spock!). Emma was killed by an explosion during a mission. Comments: Played by Lauren Lee Smith. Thanks to John Schultz for additional information about Emma. Powers/Abilities: Nikki had feral abilities, giving her superhuman strength, speed and agility, as well as enhanced senses. She was a skilled martial artist. History: Nikki Rodgers was one of the first mutants recruited into Mutant X by Adam. She and Shalimar Fox swiftly became close friends. However Adam realised it was a bad idea to have two feral mutants on the team (they tend to react to each other in a highly emotional, instinctive and animalistic way), so he dropped Nikki from the team. She ran into them again a few years later, during a fire fight in which Shalimar was shot and wounded. While her old friend recovered, Nikki lent her skills to the team in her place. However it turned out that Nikki had been the one who shot her former team mate, and she intended to kill her for usurping her place in the group. Shalimar might have been wounded, but she proved the smarter of the two; she switched off the lights in the room they were both in, and once Nikki's feral eyes had adapted to the low light level, Shalimar set off a flare in her face, blinding her long enough to defeat her. Comments: Played by Jeyna Lano. Powers/Abilities: Able to manipulate light, to create blinding flashes or laser beams. Lexa also has the power to render herself and anything or anyone she touches invisible. Skilled martial artist. History: The teams newest member, Lexa Pierce joined after the death of Emma. She acts as a go between for Mutant X and the Dominion, a shadowy group whom Adam has apparently been working for since the beginning. Lexa's main motivation is finding her brother Leo. Though Jesse has shown a romantic interest in her, Lexa refuses to let her personal feelings get in the way of her work. Lexa has an adversarial relationship with Brennan but has apparently made friends with Shalimar. While trying to rescue her brother, a "multiple" mutant, from mutant organ thieves, Lexa was forced to kill Leo to stop him from murdering Brennon. With help from the team, in particular Jesse, Lexa is coming to terms with Leo's loss, but still partially blames Brennon for his death. Comments: Played by Karen Cliche. Thanks to John Schultz for informing me of this character and providing information on her. History: Genomex security chief Mason Eckhart was a ruthless man who saw the potential in exploiting the mutants his company had helped create. Assuming control of Genomex after his assistant Frank Thorne had killed Dr. Paul Breedlove (who had been about to expose what the company had done out of a sense of guilt), Mason began to ruthlessly hunt down mutants, controlling them through subdermal governers. However the awakening of the extremely powerful and quite insane mutant Gabriel Ashlocke meant Eckhart's plans were temporarily put on ice - when Ashlocke locked him in one of his own cryogenic holding chambers. An automatic failsafe defrosted him six months later, and he returned to torment Mutant X. However at the end of a subsequent encounter, Eckhart was killed when Brennon struck him with several powerful lightning bolts causing him to fall from a great height. Powers/Abilities: While Mason has no actual powers, he is a machiavellian schemer. Comments: Played by Tom McCamus. 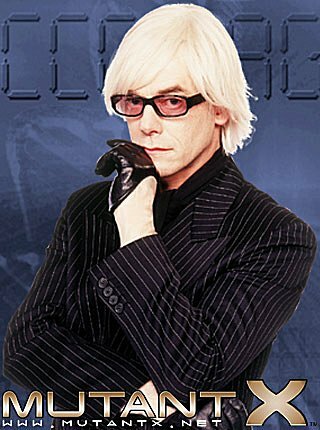 The character has lost his Andy Warhol hairstyle during his period in cryo-sleep. Thanks to John Schultz for additional information about Mason. History: Mason Eckhart's assistant at the time of his take-over of Genomex was Frank Thorne - indeed it was Thorne who killed the previous boss of the company, Dr.Breedlove, slicing him to death by hurling CD's at him at high speed. Although he seems genuinely loyal to Eckhart, he still wears a subdermal governer. He is a borderline psychotic - while he can use his powers to lethal effect, he is actually ashamed of them, and this is sublimated into sadistic rage. 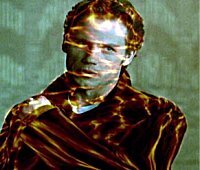 Powers/Abilities: Thorne is telekinetic, able to move things with the power of his mind. He is also a skilled hand-to-hand combatant. Comments: Played by Douglas O'Keeffe. History: Gabriel Ashlocke was the first "child of Genomex", a New Mutant who possesses powers belonging to all four categories of mutation, easily the most powerful mutant in the world - and completely psychopathic. He decided he was God, and slew his own parents. So for their own safety Genomex sealed the child into one of their storage pods, where he was kept permanently asleep. Years later, Morgan Fortier, another mutant, released the now adult Gabriel from captivity, his escaped sending Genomex into a panic. Morgan introduced Gabriel to the Strand, an extremist mutant group. He tried to recruit several of the members of Mutant X into his new group of followers, and when they refused, he kidnapped Shalimar and brainwashed her into his service. He then led an assault on Genomex, capturing Eckhart and imprisoning him in a pod, although not before the rest of Mutant X manage to retrieve and deprogram their team mate. However Gabriel discovered that his mutant genes were destabilising, and began to desperately hunt for ways to cure himself. He tried to force Adam to cure him, but in the end his body exploded. Powers/Abilities: Able to generate energy pulses. Possesses superhuman strength. Can freeze people telepathically, and take control of their minds. Can fire psionic blasts capable of killing normal people instantly. 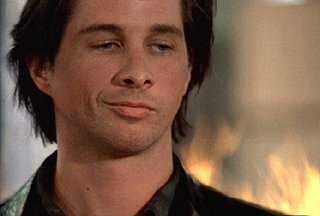 Comments: Played by Michael Easton.